Not just for mommy and me...as a family in one of our classes, you and your child will have the opportunity to play musically each week under the guidance of one of our early childhood music specialists. During class, you will sing and move to songs and rhythmic rhymes in a variety of meters and tonalities by participating in activities that include small and large movement, instrument play-alongs and community singing. 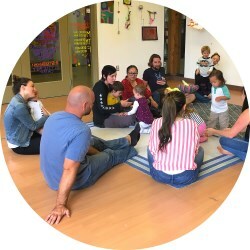 These fun activities are presented as informal, non-performance-oriented musical experiences that are developmentally appropriate for children and easy for parents and caregivers to participate in regardless of their own musical ability! What will you and your child find in a Music Together class? Your musical buffet will be complete with music from around the globe as well as original compositions written for Music Together classes. You'll find drums of all sorts, bells, triangles, shakers, balls, kitchen instruments, scarves, stretchy dancing ribbons - instruments galore! Listen and look for meows and moos, jumping frogs, squirrels and firetrucks stuck in an old oak tree and jiggling jelly all around the kitchen. We take silly very seriously! You will find high energy movers and quiet observers all intently involved in their own way in the exciting musical happenings around them. Children in our mixed aged classes range from ages 0-5. Music Together classes provide a true family music experience, as siblings can attend the mixed age family classes together. Moms, dads, aunts, uncles, grandparents and best buddies are all invited to attend. Find your Music Together class today! Copyright 2011 Songbird Music. All rights reserved.